Local wildlife photographers will display colorful images of birds of prey taken in recently restored and enhanced areas along the Onondaga Lake shoreline at the “Onondaga Lake Birds of Prey” photography exhibit March 30-31. The exhibit will showcase the diverse range of species including bald eagles, osprey, turkey vultures, hawks, owls, and falcons that have returned to Onondaga Lake. The Onondaga Lake Conservation Corps is hosting the exhibit in partnership with Honeywell, Audubon New York, and NextEra Energy. The exhibit runs Saturday, March 30, from 9 a.m. to 4 p.m., and Sunday, March 31, from 1 to 4 p.m., at Honeywell’s Onondaga Lake Visitors Center, along the southwest lakeshore in Geddes. The suggested donation is $5/person and $15/family. Left: “A Fish’s Last View” – Osprey by Walter Freeman. Right: “Wind Walker” – Bald Eagle by Greg Craybas. The images will be for sale and designated smaller sizes can be ordered. All proceeds will benefit Onondaga Lake Conservation Corps bird conservation and environmental education. Onondaga Lake became a priority Audubon Important Bird Area (IBA) in 1998 and was subsequently adopted by Honeywell, Montezuma Audubon Center, and Onondaga Audubon because of its value to waterfowl and bald eagles during the winter months. The IBA program serves as a catalyst for achieving bird conservation. The Onondaga Lake Conservation Corps seeks to inspire future stewards of Onondaga Lake and its watershed through a hands-on, experience-based program that offers citizens and organizations the opportunity to participate in activities that help restore and sustain Onondaga Lake and its value as an IBA. Since its formation in 2012, more than 850 community members have participated in Corps events. The Corps was founded by Honeywell in partnership with Montezuma Audubon Center and Onondaga Audubon and is now an Audubon New York program. Additional Corps supporters include Parsons, OBG, Anchor QEA, Bond Schoeneck & King, State University of New York College of Environmental Science and Forestry, and Wild Ones Habitat Gardening in CNY Chapter. As part of the Onondaga Lake cleanup, Honeywell has already restored about 90 acres of wetlands and about 1.1 million native plants are being planted. More than 260 wildlife species are now calling these areas home, and 130 unique bird species have been identified in and around Onondaga Lake. Honeywell also is working with federal and state government on additional projects to restore and protect wildlife habitats and enhance recreational opportunities, including creating 100 acres of new native grassland habitat and conserving about 1,600 acres within the watershed. 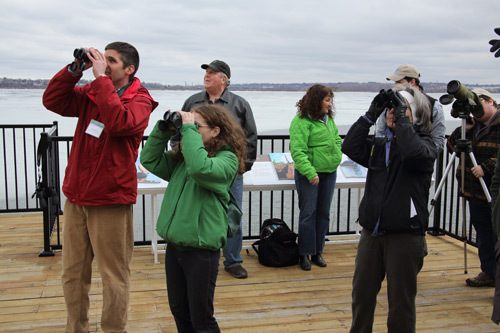 To learn more about the Onondaga Lake Conservation Corps or participate in future activities, please contact montezuma@audubon.org, visit http://ny.audubon.org/OLCC, or call 315-365-3588. Schools, community groups, local organizations, and individuals are welcome. Like the Corps on Facebook or Instagram, or visit YouTube to learn more. To access Honeywell’s Onondaga Lake Visitors Center: From Points West: Take I-690 East to Exit 7, turn left onto State Fair Boulevard, take the first left passing under I-690, drive straight toward the lake and follow signs to the Onondaga Lake Visitors Center. From Points East: Take I-690 West to Exit 7, turn right at the off-ramp and follow signs to the Onondaga Lake Visitors Center.